High quality 2 channel function / arbitrary waveform generator 15MHz/100MSa/s. 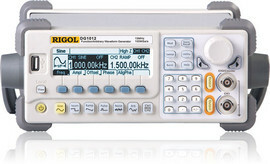 The Rigol DG1012 is a 2 channel Function / Arbitary Waveform Generator to create high quality signals up to 15 MHz (Sine). Beside the two analog outputs the devices include a 200 MHz frequency counter, a USB-Host- and a USB-device interface. 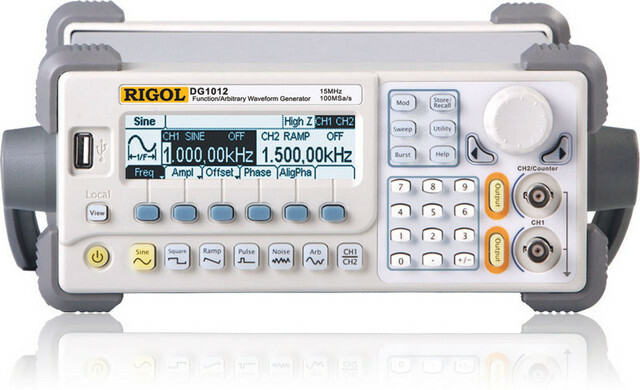 The Rigol Function-generators have a sophisticated and easy to use userinterface and offers multiple functions for all tasks. The menu navigation is very intuitional in use and all functions and parameters are easy to reach because of the graphical interface. Both output channels can be configured separately. The instrument has 48 built-in arbitrary waves (contains DC) which including common, math, engineering, window function and other common waves. The counter can be used to measure frequency, period, duty cycle, positive pulse width and negative pulse width within the range of 100 mHz to 200 MHz. The devices have a filesystem for the storage of waveforms in the internal memory or on USB sticks. The integrated help-function will show descriptions of single functions and step-by-step instructions for often used tasks.